Two wildfires that hit California threatens homes and could result in the evacuation of hundreds of people, US officials say. 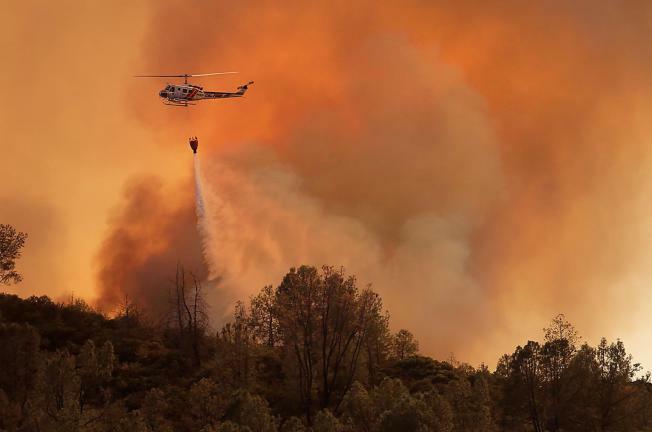 In the Sacramento region, a fire has spread to cover an area of about 4,000 acres, while another blaze threatens homes around Yosemite National Park. The Sacramento fire is only 20% contained, officials told local media. Months of drought have caused more fires in California this year – some 1,400, twice the usual number. The Sacramento fire in the north of the state has doubled in size since it broke out on Friday afternoon, the Los Angeles Times reported officials as saying. About 515 homes were evacuated as the blaze tore its way through drought-hit grassland. “The fire’s moving in and around homes in the area,” California Department of Forestry and Fire Protection spokeswoman Lynn Tolmachoff told the AP news agency. Nearly 1,500 fire fighters and aircraft that included a DC-10 air tanker are battling the blaze, which has sent up huge plumes of smoke and reduced air quality in the Sacramento area. Officials at dusk on Saturday said that cooler weather and less wind had brought some respite. Meanwhile a 500-acre fire that started on Saturday afternoon is threatening homes in Yosemite. Evacuations are reported to have been ordered in Foresta, a community of about 45 homes inside the national park where many employees of the park live.